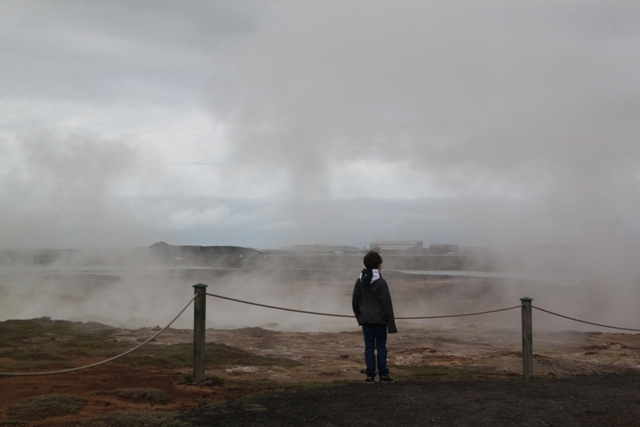 The 9 year old has become fascinated with the idea of geothermal power – when he spotted a geothermal power station on a leaflet as a visitor attraction, he pestered us to go there and check it out. Bit of a strange interest, but we figured we should “indulge” him and visit this place. We drove for about an hour, found the power station easily – you couldn’t have missed it, a huge building in the middle of nowhere. It looked empty and nothing was going on. We managed to find someone who told us it doesn’t actually open to visitors until a few weeks later. Apart from the people who work there, it was tourist free. The 9 year old was disappointed, but he managed to sneak a peek inside one of the open doors. What we did find close by though was Gunnuhver hot springs. This made up for the earlier disappointment. 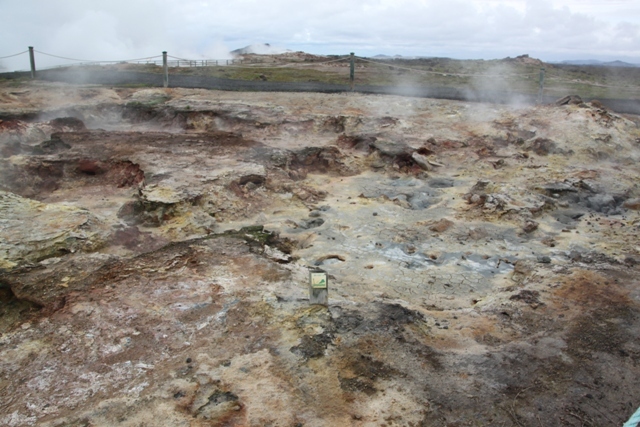 A collection of steam vents and mudpools with lots of walkways and ramps so you could easily explore. Yet again, we had the whole place to ourselves. There was a big information board with a folk story about the springs. Locals say an old witch was thrown into the earth here to stop her casting spells on the local people. The steam coming out of the earth is the witch, venting her fury on all who pass by. The 9 year old, not normally such a sucker for this type of story looked a little unsure and just a tad freaked out. It is a weird, eerie kind of place, so you do get just a bit sucked into the story… maybe…..
We walked around the whole area, it is fascinating. The colours of the mud and the earth are incredible – they look unnatural and like nothing I have seen before. The pools bubble, hiss and steam and really draw you in, they are mesmerising. 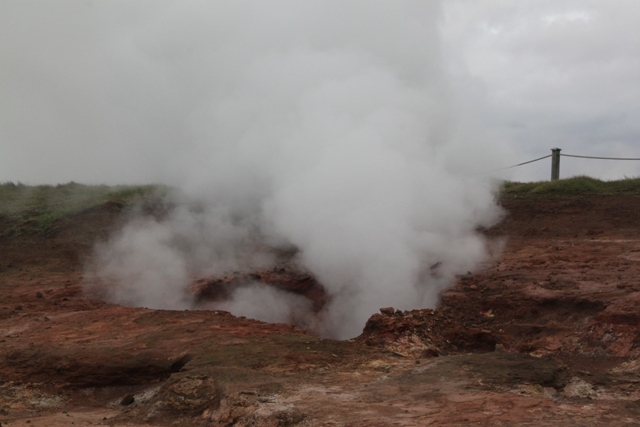 The only thing not to like is the (very) strong smell of sulphur. 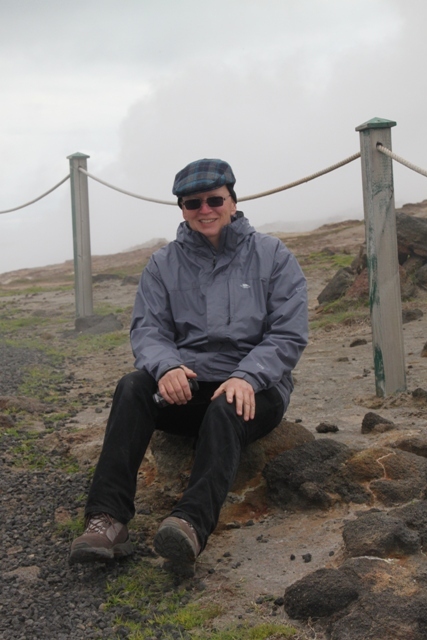 It was not too cold when we arrived, but a huge black cloud settled overhead and the temperature plummeted. Instantly we almost froze. Husband found a novel way to warm up though – he plonked himself on a big stone at the edge of the path, it was warm and toasty, a heated seat created by nature.